Following their two concerts in Milan, The Beatles were driven in four cars to Genoa, Italy by the Alfa Romeo Racing Team. 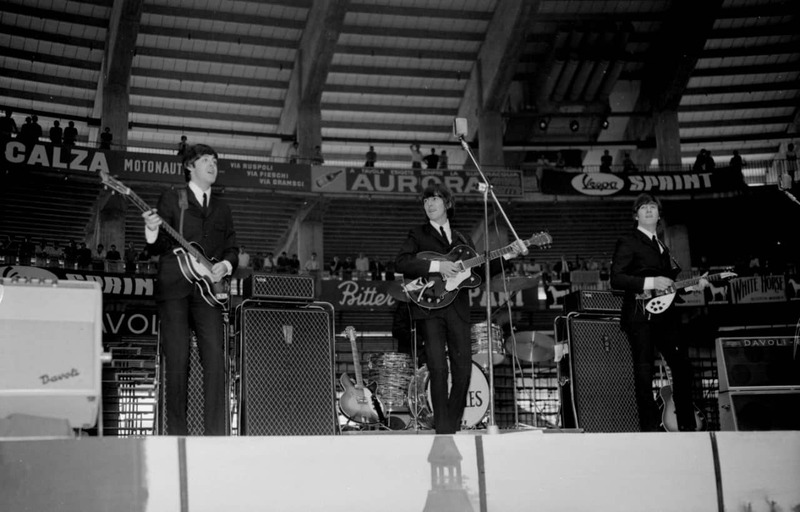 The group performed two shows at the city's Palazzo dello Sport, a 25,000-seat arena, at 4.30pm and 9.30pm. As in Milan, tickets for the afternoon appearance sold poorly, with just 5,000 fans seeing The Beatles play; the evening show was seen by 10,000. The group performed 12 songs during both shows in Genoa: Twist And Shout, She's A Woman, I'm A Loser, Can't Buy Me Love, Baby's In Black, I Wanna Be Your Man, A Hard Day's Night, Everybody's Trying To Be My Baby, Rock And Roll Music, I Feel Fine, Ticket To Ride and Long Tall Sally. The Beatles remained in Genoa for just a short time. Immediately after the second show they flew to Rome in a chartered aeroplane. Hi Francesco. Thanks for the message. I didn’t know the date was incorrect. Could you let me know where I could see some articles that give the date as 26 June please? Hi Joe,I’m ready immediately to satisfy your application, if you communicate me your address e-mail. Allow to tell me however that” the error of the date” is alone verifiable in the foreign publications, because in Italy we know it for a long time that The BeaTles have played Saturday June 26 th 1965 in Genoa and believe me without the least doubt! In every case I repeat, to resolve the matter is very simple and fast, so much that I believe really one day or another I will write to Mr.Mark Lewisohn, since this absurdity error lasts from too much time. Finally, to the afternoon show there were 5ooo people, to that evening 10.000 people! How come they couldnt sell more tickets? Did it have anything to do with Johns Jesus-statements? No, those comments by Lennon were made in 1966. Tickets for the Milan shows the previous day also sold poorly. Local press put it down to high ticket prices and hot weather. Perhaps the same applied for these Genoa shows. Tickets for the Milan shows a couple of days previously also sold poorly. Local press put that down to high ticket prices and hot weather. Perhaps the same applied for these Genoa shows.